Do you love to socialise? If so, then here are two days that you can be part of next month. Learn about what these days mean, some fun facts and how to improve your English below. On the first day of March we celebrate St David’s day in honour of the Saint David of Wales who died on that day in 589 AD. He was a Celtic monk who lived in the 16th Century and spread the word of the religion Christianity across Wales. His most famous story is of him standing on a hill and preaching about Christianity… then the ground on which he was standing rose up… and the huge crowd could hear his words. How do British people celebrate this day? Some children wear the national dress of Wales which is a tall black hat and a red cloak. 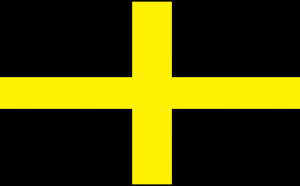 Most people mark this day by wearing the Welsh emblem which is a small daffodil or leek. You usually see magnificent yellow daffodils at the start of Spring which is a very exciting occasion for British people! Why? Because the sun is coming! Goodbye Winter! Want to hold your own Welsh dinner party? Welsh cuisine is wonderful! Try making ‘Cawl’ a dish made with lamb & a mixture of Welsh vegetables like leeks & swede and of course a fusion of herbs like rosemary, thyme & parsley. If you’d like to improve your English, follow this link and learn more about English parties! What can EC students do to celebrate St David’s? The letters: K, Q, V & Z do not appear in the Welsh language! If you’d like to improve your English, meet new people and check out the wonderful sights of London, why not think about taking some English classes for adults in the UK? !